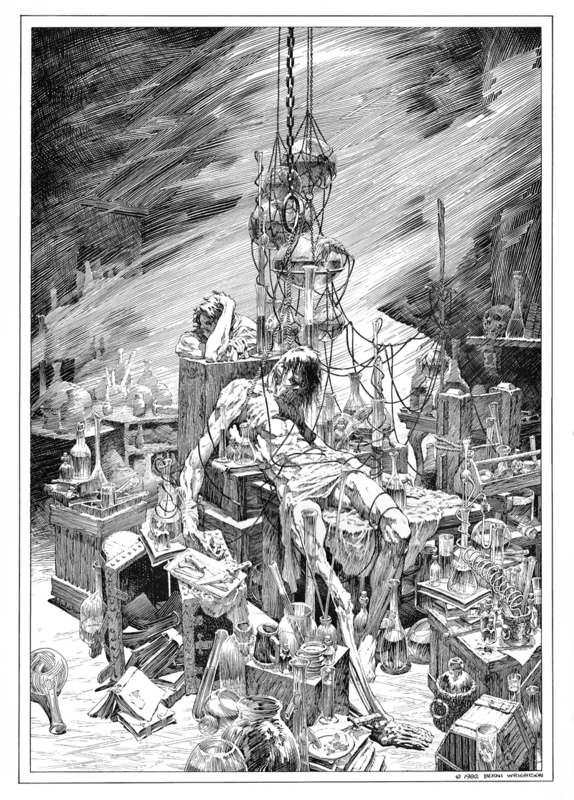 Bernie Wrightson’s Frankenstein Portfolio (1980) | 'TAIN'T THE MEAT… IT'S THE HUMANITY! 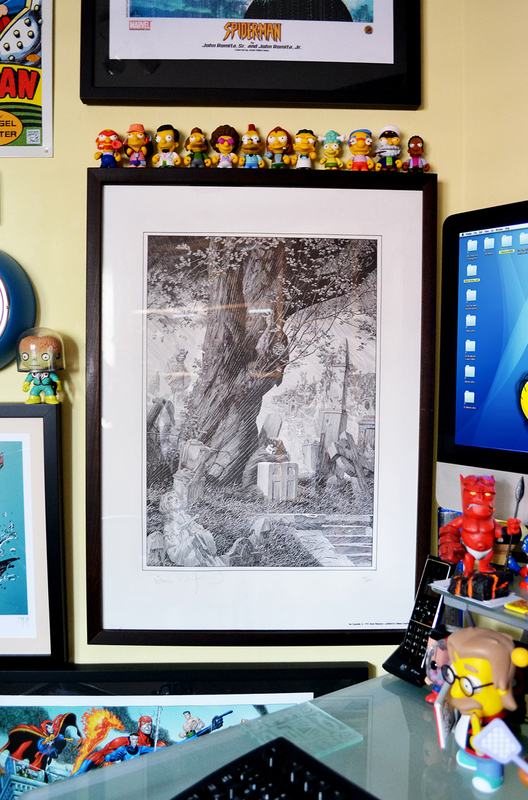 Over the years I’ve amassed a large collection of Portfolios by comic book artists, some of which I’ve already posted on this site. These 4-6 print sets, many from the early 1980’s, have always held a fascination for me, and while most of those in my collection are visually striking, Bernie Wrightson’s Frankenstein Portfolio from 1980 is easily the most beautiful. 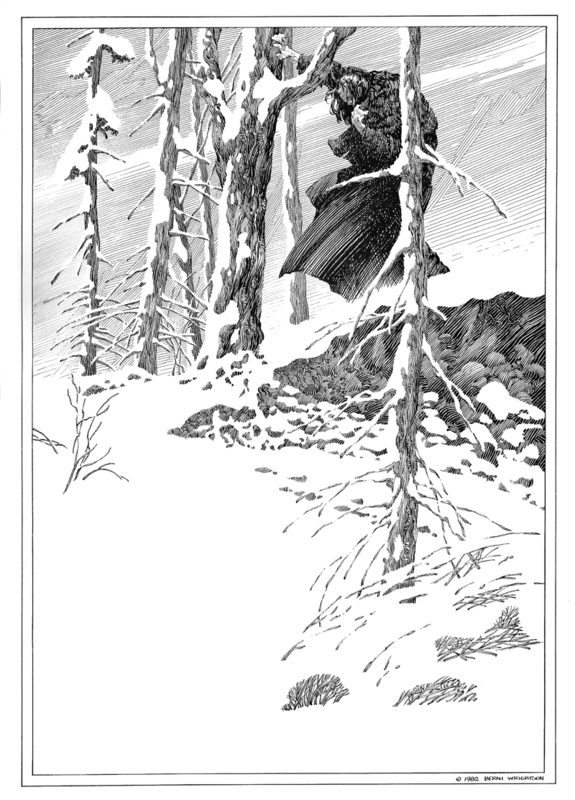 Between 1976 and 1982 comic book artist Bernie Wrightson (during the ’70’s and early ’80s he dropped the ‘e‘ from his name to avoid confusion with the Olympic diver) drew 50 pen and ink illustrations to accompany Mary Wollstonecraft Shelly’s gothic masterpiece Frankenstein. 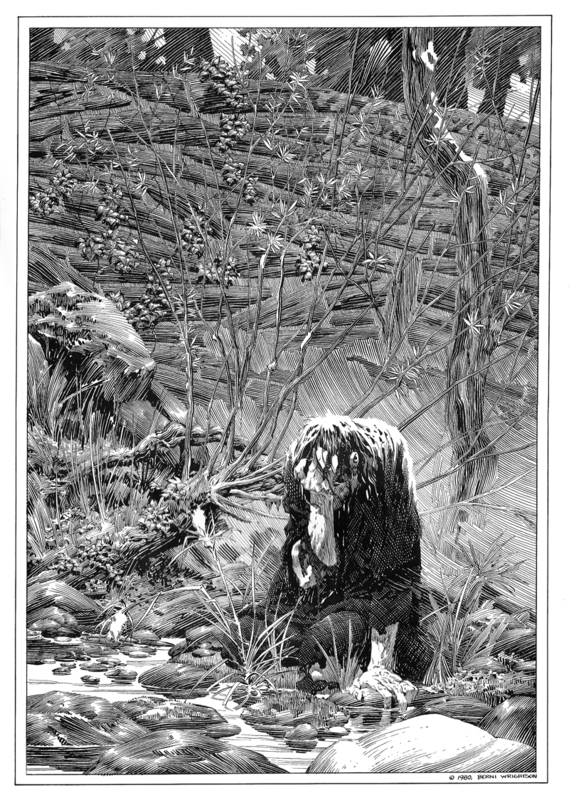 Wrightson, a mainstay at DC Comics in the Seventies and co-creator of fan-favourite Swamp Thing, set himself the goal of mimicking the engraved style of illustration popular when Shelley’s story first saw print. As a life-long fan of the book he originally penned the illustrations purely for this own amusement and fitted the work in between paid assignments. 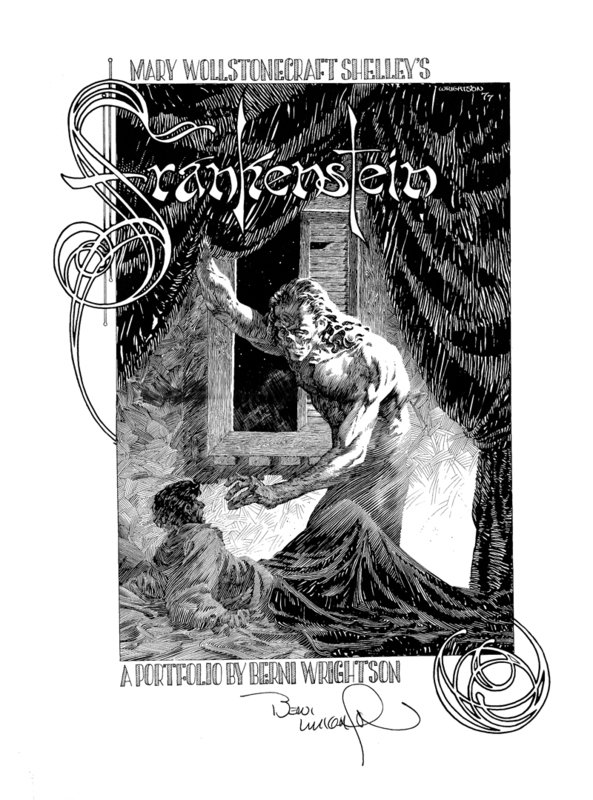 But with artwork of such high quality it was inevitable that the drawings would see print and in 1983 Marvel Comics published a special edition of Frankenstein incorporating 43 of Wrightson’s wonderfully detailed illustrations. 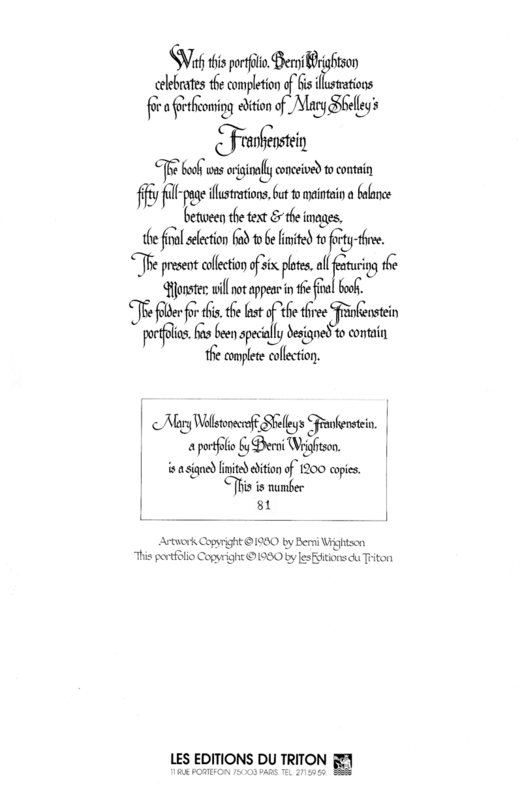 But before that edition was published three six-plate portfolio collections featuring drawings from the book were released: two by Tyrannosaurus Press and a third by French publisher Les Editions Du Triton. This portfolio – the third – was released in 1980 and contains illustrations not used in the final book. Published as a limited run of 1,200 copies (this edition is #81) the set contains six high quality black and white prints measuring 16 x 11 inches printed on thick watercolour stock. 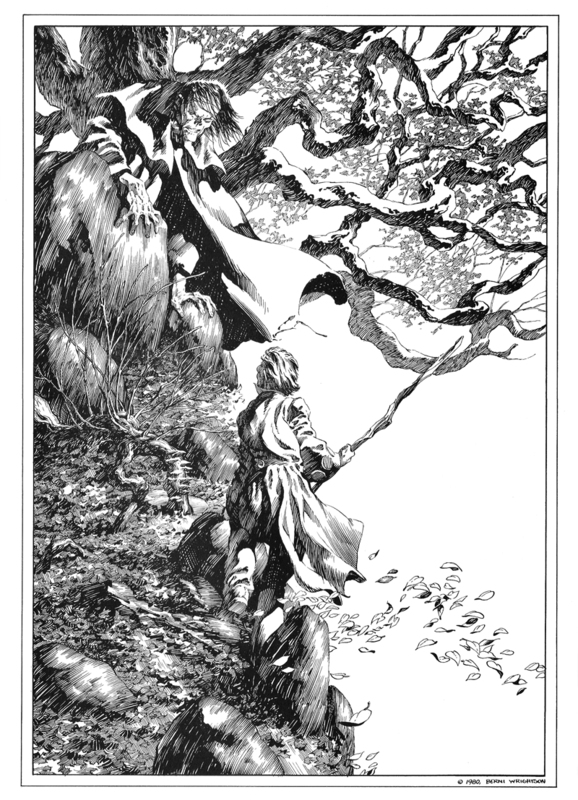 The superior paper stock allows the fine detail of Wrightson’s penmanship to shine – these really are gorgeous illustrations. The plates shipped in a large fold-out envelope made from the same paper and each edition was hand-signed by Wrightson. According to the back of the Portfolio the prints in this collection were omitted from the book due to lack of space. 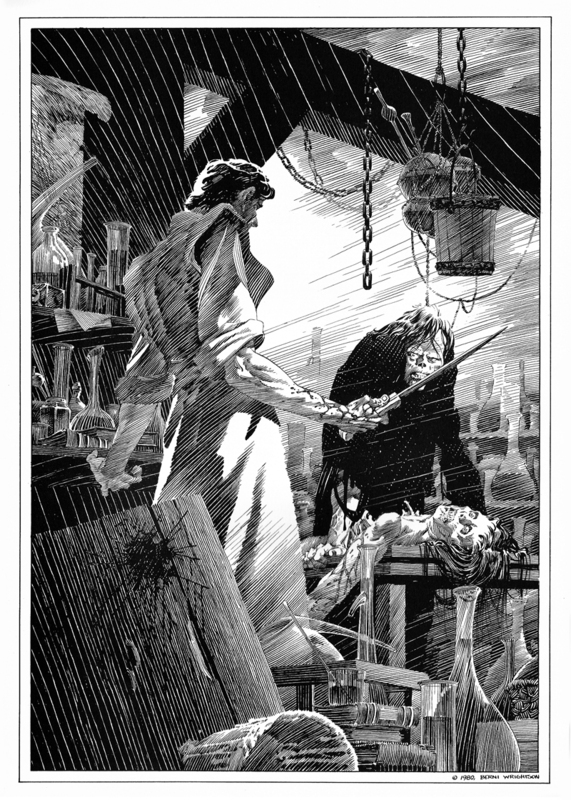 The decision to drop them must have been a tough one as the illustrations are in no way second rate – plate 2 is a particular favourite of mine, the level of detail in Frankenstein’s laboratory is breathtaking. 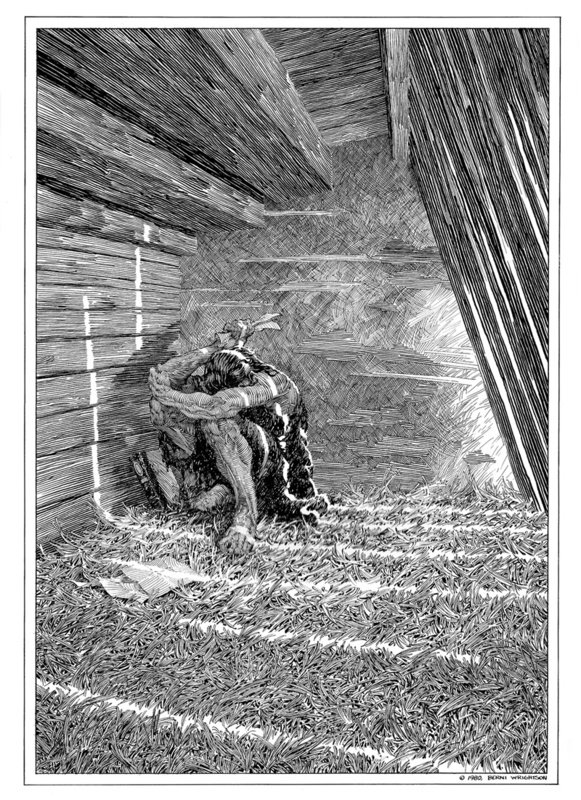 After the publication of the Marvel edition interest in Wrightson’s interpretation of Frankenstein continued to grow and in the early Nineties Glimmer Graphics released some of the illustrations as 27 x 19 inch limited edition prints signed by the artist (I have the first one framed and hanging in my office). Then in 1993 FPG released a set of trading cards reproducing 45 of the illustrations (including three from this Portfolio) and in 2008 Dark Horse Books reprinted the Marvel edition as a handsome, large format hardback. 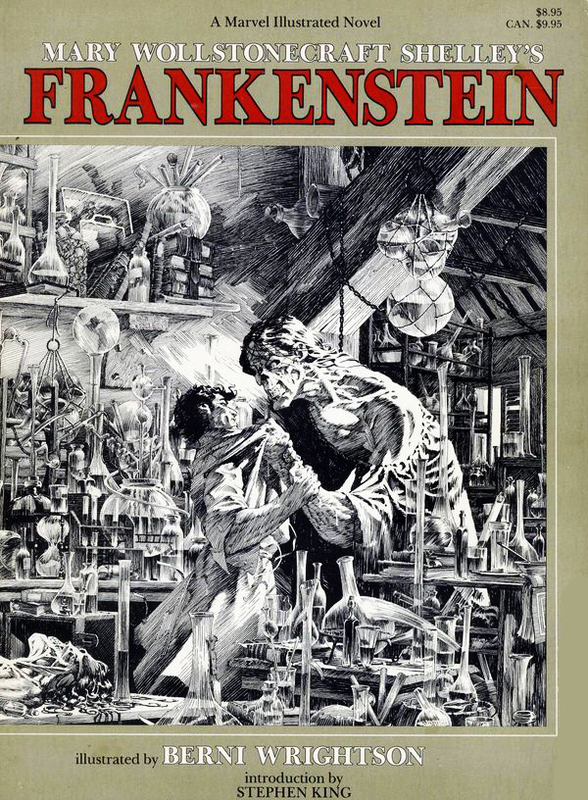 And in 2013 Wrightson and author Steve Niles returned to Mary Shelly’s famous creation for Frankenstein Alive, Alive!, a new comic book sequel to the 1983 Marvel edition, for which Wrightson received an award from the National Cartoonists Society. This portfolio is one of the jewels in my collection and although I haven’t yet been able to track down the two sets published by Tyrannosaurus Press I’m confident that one day I will (I do have a complete set of the FPG trading cards though and I’ve posted them here). I can also recommend the Dark Horse hardback edition from 2008 – Wrightson’s wonderfully evocative illustrations really do the story justice and I very much doubt they will ever be surpassed.